Once again we thoroughly enjoyed our trip to Wadebridge Wines Christmas Tasting at the Showground. A full minibus of U3A members tried out their favourite tipple or tried out a new supplier from the multitude of wines on offer. Some even stocked up their wine racks for Christmas! Our host for November was Christine, who decided to take us on a journey round the world to cover countries from which she would not normally buy wine. tasted a white from there before. This was a Tilimuqui Fairtrade Single Vineyard Organic Torrontés from Waitrose priced at £8.79 described as "A crisp, fruity organic Fairtrade white wine made from Torrontés; the aromatic profile of which is shown exceptionally well here, offering fragrant, gently spicy, citrus-fruit flavours". We were not familiar with the grape but research shows that "Torrontés is a white Argentine wine grape variety, producing fresh, aromatic wines with moderate acidity, smooth texture and mouthfeel as well as distinctive peach and apricot aromas on the nose. Three Torrontés varieties exist in Argentina: Torrontés Riojano, the most common, Torrontés Sanjuanino, and Torrontés Mendocino. It is primarily Torrontés Riojano that has received attention for the quality of its wines, and is the variety used for most Argentine wines simply labeled Torrontés. ". Never too old to learn! Next we moved to Macedonia. 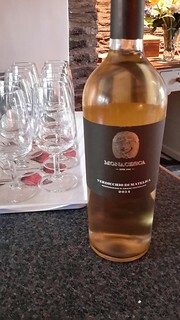 A white wine from M&S (currently out of stock online but normally £8) described by their website as follows "This crisp, dry white hails from Tikves, the oldest wine growing region in the Balkans, where the ancient grape varieties are cooled by mountain air, developing attractive apple and pear aromas." 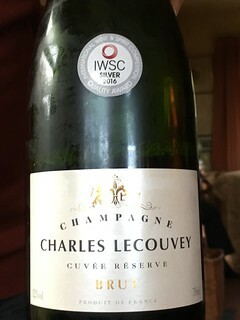 It was recommended as a party wine which we could see. On the whole we felt it rather "thin". bottle it is described as: "A dry white bursting with green mango, lychee, sweet basil, greengage and gooseberry flavours." M&S recommend it to go with curry but some of us were a little sceptical about this. 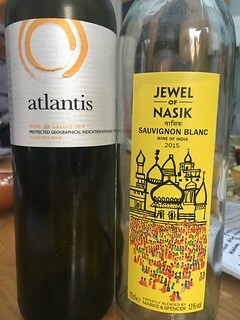 The final destination was quite a surprise - the Greek Island of Santorini for a delicious white with zingy aromas of lime and orchard fresh pears followed by honeyed, gooseberry fruits. The grapes were 90% Assyrtiko, 5% Aidani and 5% Athiri. 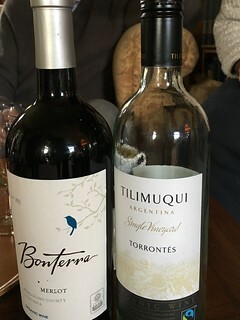 This was definitely the hit of the day taste wise but at £12 per bottle a few of us felt the Argentinian wine perhaps offered better value for money. A great afternoon with a full house of members around the table. Thanks Christine! Monday’s event was inspired by Nick and Jo’s recent River Cruise along the River Danube. 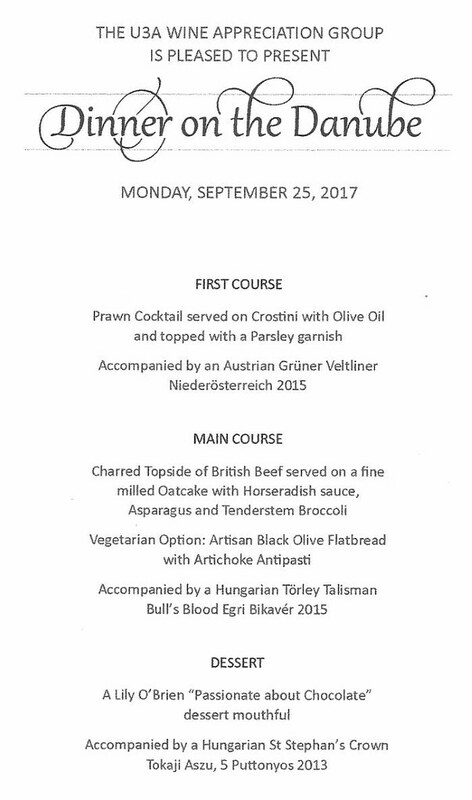 Upon arrival group members were presented an intriguing and professionally designed menu. 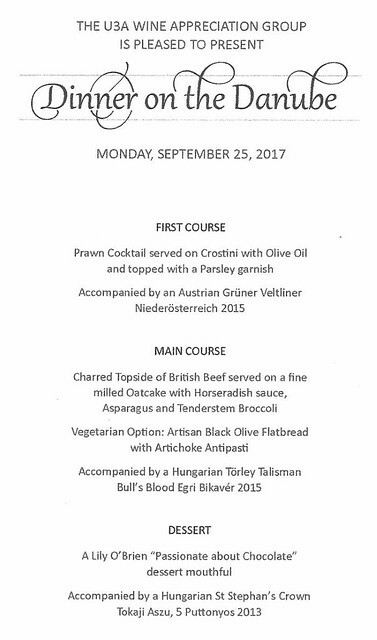 On any trendy restaurant menu and you'll start to see 'Austria' popping up more and more. Leading the way is this wine, nicknamed Gru Vee (not only to make it easier to say, but because it's what all the culinary trendsetters are drinking). It's the most widely planted grape variety in Austria. “ Full of beautifully balanced flavour and great with food, it's a little gem well worth discovering” according to the blurb. Exclusively made from top quality, hand-selected grapes including perfectly dried raisins. The St. Stephan's Crown brand name emphasises the nobility of the wines by naming them after the first Hungarian king. This wine originates from Hungary's most well-known region, Tokaj-hegyalja. The wines of this region maintain an exceptionally high quality level thanks to the volcanic soil, the unparalleled microclimate and the careful attention and skill of its winemakers. Traditionally and uniquely in Tokaji, the richness of the wine depends on how many 'puttony' (a 27-litre harvester's hod) of botrytized berries are blended with a 'gönci' (136-litre cask) of dry wine or must. Overall a very enjoyable and entertaining afternoon with an original approach. Thanks to for Nick for arranging the event.
" We suggest a change of date from Monday 28th to Tuesday 29th August. 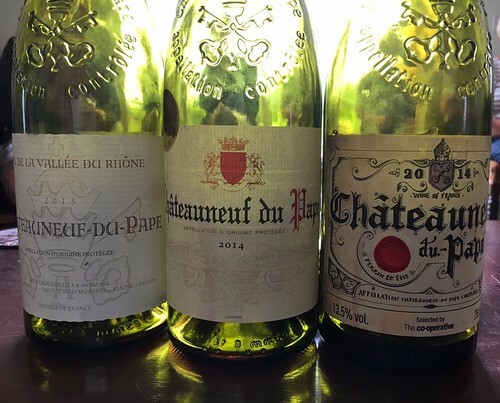 This is to accommodate those members who wish to participate in the special event of the inaugural peal of the new bells at St Winnow Church"
Our host for July was Jenny who had arranged a selection of Chateauneuf du Pape bottle for us to try. She had chosen some local supermarkets for her purchases - Asda, Lidl and Lostwithiel Co-op. Jenny noted that there was very little information provided about the wine on the labels. Most of the space was devoted to how to recycle the bottle in one case or information about safe drinking limits on another. Luckily there is more information available online! Translated as ‘The Pope’s new castle’, Châteauneuf-du-Pape often bears the papal seal embossed on its bottle. The historical reference dates back to the 14th century when the papacy was relocated to the city of Avignon, just a few miles south. The vineyards are famously covered in ‘galets’ or ‘pudding stones’, large pebbles that absorb the sun’s heat by day and release it overnight, thus helping ripen grapes to produce wines of generally high alcohol. But the galets are not ubiquitous, with no sign of them in many excellent vineyards, which may be composed of ‘Safres’ (compressed fine sand), ‘Grès Rouges’ (red sandstone) or ‘Eclats Calcaires'(porous limestone). The famous red Chateauneuf, in its heavyweight bottle, with the embossed papal cross keys sign, can be produced from up to 13 different grape varieties, although Grenache, Syrah, Cinsault and Mourvedre dominate. The rich, juicy berry fruit flavours of Grenache blend particularly well with the spicy structure of Syrah, and added weight and intensity is provided by the hearty, intense Mourvedre, with its full tannins, supplemented by fruity, juicy Cinsault. Style: Rich, intense, full flavoured yet textured and perfumed wines, full of very ripe black fruit flavours, integrated oak and velvety sweet spice edges. Grapes: Grenache, Syrah, Mourvedre, Cinsault, and small quantities of up to 9 others, including Counoise, Terret noir and Picpoul noir. Good with: these full on, spicily rich wines cope brilliantly with rich, red meat dishes, such as lamb shanks, venison, oxtail, and braised beef. They also cope well with anything with olives and gentle spices. Also perfect with strong, mature cheeses. The wines were all priced around the £10 mark with most of them being available at a reduced rate at certain times of the year. Glasses are being raised to the English wine industry after another record year in which production jumped by almost a fifth, according to figures published today. Turnover for independent wine producers increased to £132 million over the past 12 months, a 16 per cent increase on the previous year. The English wine industry is now three times the size it was five years ago, with consumption growing rapidly both at home and abroad after a series of high-profile awards. Earlier this year, the Norfolk-based Winbirri Vineyards’ Bacchus 2015 was named the world’s best white wine at the Decanter World Wine Awards. The 2015 pinot noir from Bolney in West Sussex won a silver medal at the International Wine Challenge. To meet growing demand Waitrose, which sells seven of every ten bottles of English wine bought in the UK, has planted 50 per cent more vines at its Leckford estate in Hampshire. The new vines are expected to boost production from 30,000 to 45,000 bottles a year. Growing sales are also encouraging new producers to enter the market, with a record 64 prospective wine producers obtaining a licence for production last year. Pierpaolo Petrassi, head of wine at Waitrose, said sales of English wine had grown by 45 per cent at the supermarket over the past year. “Our customers have really embraced home-grown wines. There’s definitely a talking point when it comes to serving English fizz to family and friends. 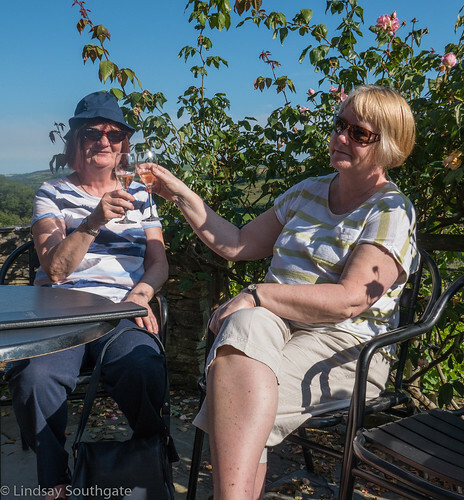 On Wednesday 5th July a group of 16 U3A members, many from the Wine Appreciation group, joined a Grand Tour and Tasting at Camel Valley Vineyard. We were chauffered superbly in the Lerryn minibus by Annie Singer - huge thanks are due to her. We were delighted to have a beautiful, warm summer's evening for our trip which certainly added to the atmosphere. 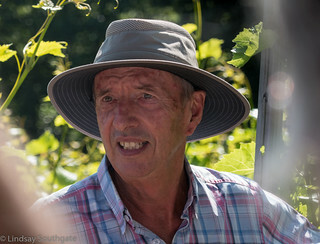 The tour was expertly delivered by Bob Lindo, the founder of the vineyard, who is clearly in his element when introducing visitors to his estate and to the intricacies of wine making. As ever we each had our own favourites but judging by how many bottles were loaded on to the minibus before we left everybody found something they liked! Once again thanks to Annie, our volunteer driver, and thanks to all those who joined the trip. NOTE: Slide show below may not work on all devices. Alternative version of slide show available here. Photos may also be viewed on our Flickr Page. A record turnout for our May meeting was kindly hosted by Alan. Much to the amusement of his guests Alan's wife. Marion, had selected the wines for us to try this month - based on "pretty labels" from Waitrose! Whilst we may have laughed initially we finished the afternoon thinking there must be something in it! Charming fizz. Full of fruit, lovely colour and not too dry. Excellent as an aperitif or to sip all evening. Cute bottle and a great price make this a party winner and affordable for a mid week treat. From the beautiful island of Sicily, this easy drinking wine is delightfully fresh, fruity and crisp. Inspired by the bustling Sicilian cafe culture (as on label), this delicious blend of local grape varieties is vibrant and easy going. Fresh citrus and tropical fruit flavours make this dry white wine a perfect match with grilled fish and salads. Modern style, easy-going Portuguese red wine with generous fruity palate and soft tannins. A full bodied Portguese red which is excellent value for money and much better quality than perhaps the label suggests. If you're looking for a rich and flavoursome red to sip by the fire on a frosty evening, then Gran Passo ticks all the boxes. Produced using a mix of local and international grape varieties, Touriga and Frannca, Tinta, Roriz, Castelao and Syrah.This wine displays notes of cassis, black plum and black cherry, combined with a subtle violet character. The perfect match for stews and casseroles. As ever different people prefer different wines but everybody enjoyed the three we tasted, and we enjoyed the added dimension of voting for our favourite label too! Every Wednesday evening at 5.00pm between April and October, with an additional tour at 5.00pm on Thursdays throughout August. A wine maker will personally guide you through the vineyard year and winery process, answering any questions you may have. 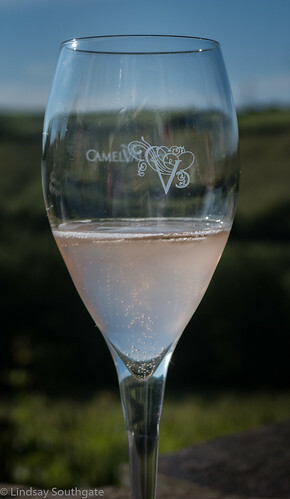 Afterwards, there will be a fun wine tasting session, beginning with our most famous wine, Cornwall Brut. We aim to taste a minimum of 5 wines, and you can of course buy wine by the bottle or case after the tour. " I have been able to reserve the Lerryn Minbus and a driver for Wednesday 5th July. We would leave Lostwithiel at approx 4.15pm and return by about 7pm. The cost would be £15 for the tour and approx £2.50 for the minibus. We will be able to take 16 people. Spaces will be offered to the Wine Group initially and then opened up to all members of the U3A. To reserve your space please email lindsayjsouthgate@gmail.com to be added to the list of attendees. In a few weeks I will collect the monies due from each participant - the same system as used by the Theatre and Photography Groups. 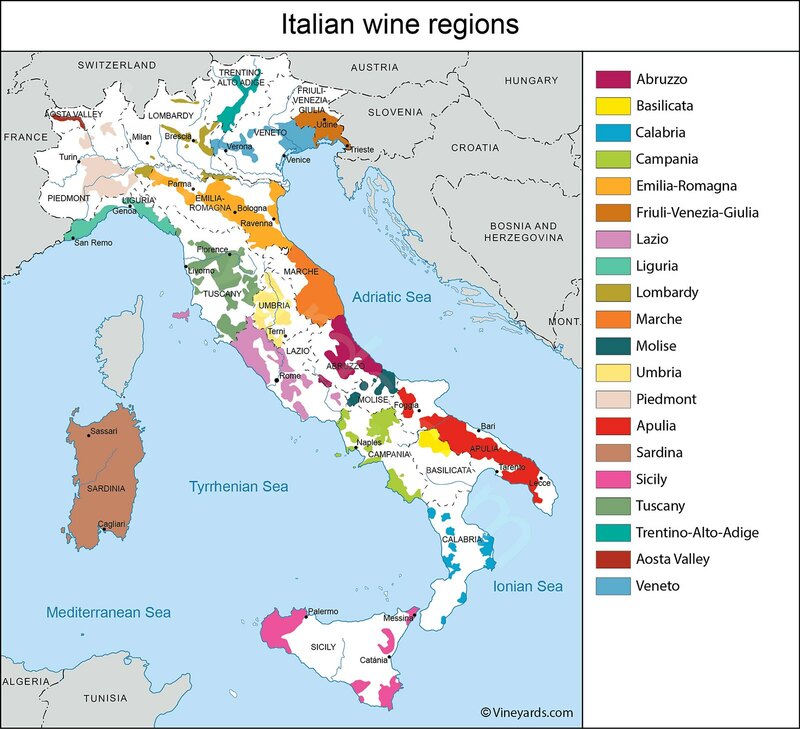 The first wine we tasted was a white wine from the MARCHE region of Italy , selected at random, which is east of Umbria, and on the coast. One of the main grapes grown in this area is the VERDICCHIO grape and the wine was called MONACESCA. It had a yellowish colour and and was quite a dry wine. It was enjoyable to taste if somewhat unremarkable. of Italy and was a PRIMITIVO grape giving the wine a really rich red colour and a full flavour. 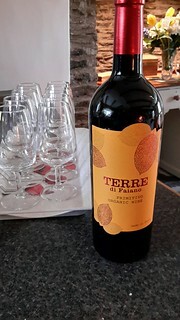 The wine was called TERRE DI FAIANO and everybody seemed to enthuse about the wine. Thank you everybody who came, we enjoyed your company. A beautiful Spring afternoon saw us gather at Helen's for our March meeting. Many of you will remember Jean Ashbridge, our first Wine group Contact, who sadly passed away. 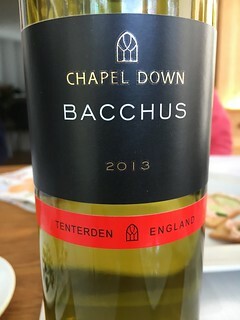 We were pleased to raise a glass to Jean as we started the afternoon with a Chapel Down Bacchus 2013 from Jean's cellar. From England’s fourth most planted grape variety, this is a great alternative to Sauvignon Blanc. It displays aromas of green apple, gooseberry and freshly cut grass. It is light, crisp and fresh with a tangy edge and some elderflower notes on the finish. We all approved of Jean's taste! 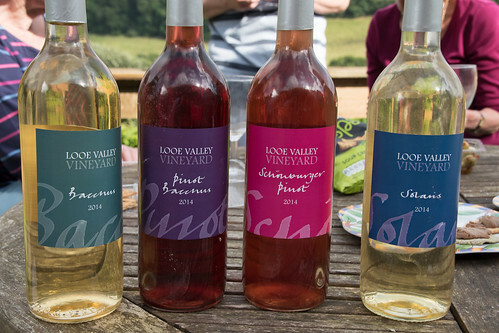 The 2013 vintage is no longer available but the 2015 is currently selling from the Tenterden vineyard at approx £12.99. Orieux. Interestingly it is shipped to Falmouth under wind power by Transport a la Voile. The shipping method had certainly not harmed the taste of the wine which suited the sunny afternoon perfectly. This wine is available for £12 from Wadebridge Wines. nose. It is a blend of Shiraz, Cabernet Sauvignon, Merlot, Cabernet Franc, Malbec and Petit Verdot - something for everybody in there! 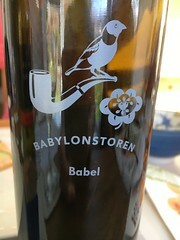 Again we all enjoyed this wine but some felt it might be a little more rounded in a couple of years time. The majority vote went to the Chapel Down Bacchus yesterday - Jean would surely have approved. Jean & Eric kindly hosted our February meeting. They decided to offer us two organic wines, followed by some award winning "bubbles". 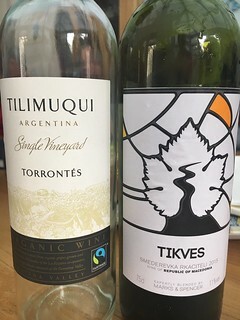 The white wine was Tilimuqui Fairtrade Single Vineyard Torrontés (Waitrose £6.39, normally £7.99). It is described as a crisp, fruity organic Fairtrade white wine made from Torrontés; the aromatic profile of which is shown exceptionally well here, offering fragrant, gently spicy, citrus-fruit flavours. the relationship has blossomed and Waitrose sales have raised £20,000 fairtade premium for the community, with is used to fund local programs such as their agricultural school. The winery, called La Riojana, is well known for producing outstanding wines. Last year they received a Gold Decanter award for their Tilimiqui Cabernet Sauvignon/Bonarda. None of us were familiar with this grape but we all enjoyed sampling it! The red wine was Bonterra Organic, Merlot, American, (Waitrose £11.99). The Waitrose website description is "Bonterra Vineyard wines are made from quality, organic grapes and this beautifully crafted Merlot is a great example of their winemaking. It has a rich, full, plum and spice nose, with silky texture." It was a definite hit with many of our group. ,,,but not quite. 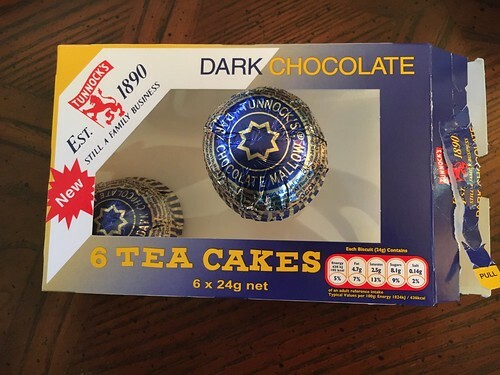 Jean decided to offer us an extra tasting - Tunnock's dark chocolate tea cakes (Waitrose £1.00)!! Many thanks to Jean & Eric for an enjoyable afternoon. We started off 2017 with a comparison of the "value" of wine in bottles priced at various price points given the amount of duty, VAT, distribution and margin applied to each bottle. To test this out we tried a bottle priced at £7.50, £12 and £15. 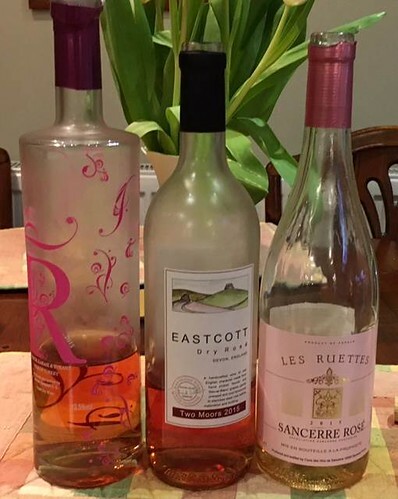 To escape the winter we went for three cheeky rose wines! A very pretty refreshing dry rosé scented with aromas of rhubarb and raspberries. Cool nights in the Denizli region of south west Turkey and the chalky, mineral soils of the steep vineyards in which it is produced all contribute to its lively, crisp style. About this bottle: This wine is a collaboration between local winemaker Sibel Coban and French expert Florent Dumeau, who have combined traditional and modern techniques to create a wonderful rosé that delighted Jeneve Williams, the M&S winemaker, on her Eastern Mediterranean travels. This off-dry English rosé has a bright strawberry colour and aromas of red fruits, balancing cranberry and redcurrant flavours with citrus and green apple notes. About this bottle: Eastcott is a small vineyard and winery in Devon owned and run by Richard & Hilary Waller. The couple planted their first vines in 2008 and take care of all the vine growing and winery work themselves. Through their wines, the Wallers seek to express something of the gentle character of West Devon. 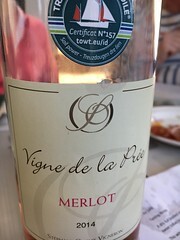 Richard Waller, who studied winemaking at Plumpton College in Sussex, crafted this unique ‘red rosé’ by blending 60% Ronda grapes - an early ripening modern variety that gives a soft red fruit character - and 40% Seyval Blanc, a white grape that lends the wine its crisp backbone and appley bite. An aromatic and delightfully crisp, elegant rosé made from the prized Pinot Noir grape. This has a succulent, fresh flavour of raspberries and strawberries. We all enjoyed each wine for their different characters. Whilst the most expensive wine was probably the favourite we felt that the Turkish wine which was half the price was excellent value. We were all impressed by the English wine at £12 and intrigued by the apple flavours. We hope to plan a visit to this vineyard later in the year. We had a great time at our annual trip to Wadebridge Wines Christmas Tasting on 23rd November. Alan will be collecting our orders shortly and delivering them to us in time for Christmas. Our adventures during 2016 may now be followed on this page. Our first event of 2017 will be at Keith and Lindsay's on January 30th.